Like all living things, birds need water, even in the dead of winter. Fortunately for the many, many birds in the far north that spend the entire season far from feeders, they can get all the water they need from snow and dripping icicles. Most birds conserve their bodily fluids more efficiently than mammals do, so usually require less drinking water. 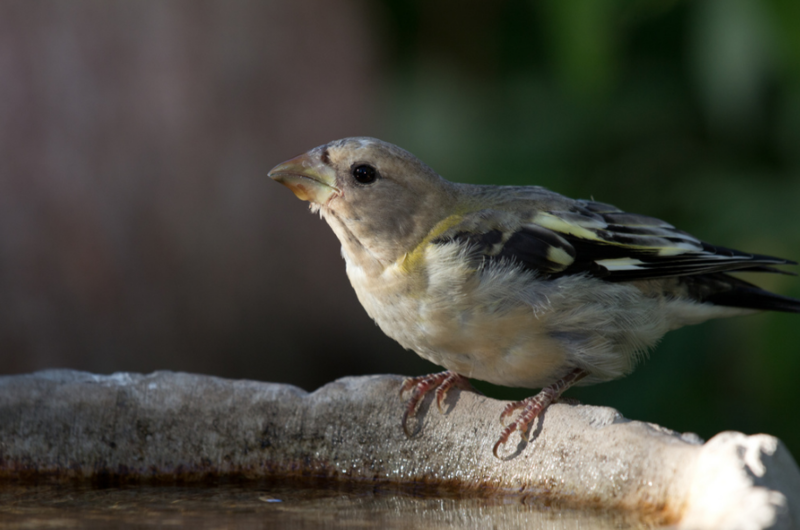 But when birds do find a rich source of water, such as a puddle or a birdbath, they often gather in large numbers to drink and, more rarely, bathe. 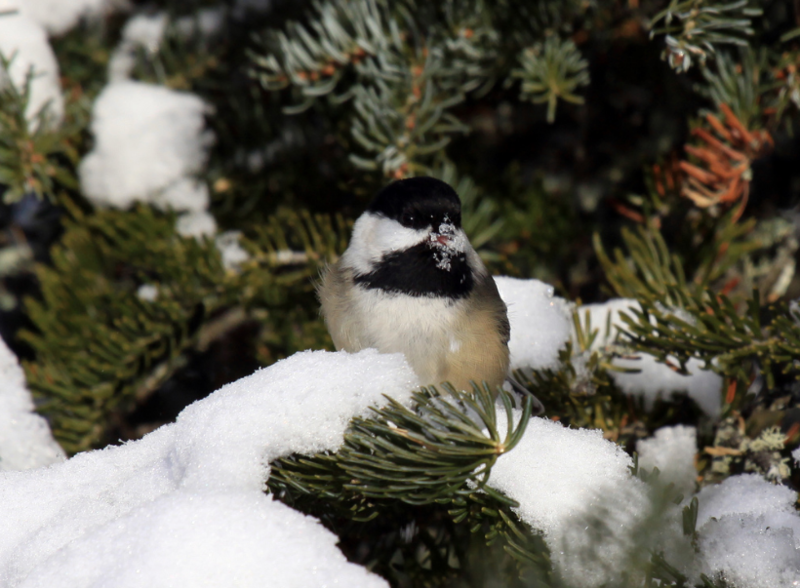 Chickadees and other birds can get the water they need by eating snow. Unfortunately, bathing in winter can be dangerous. Puddles tend to melt only when the temperature is high enough that water on feathers won't freeze before the birds have a chance to shake it off. But when birds bathe in a heated birdbath on a frigid day, their feathers may, indeed, get iced up. There are documented records of starlings dropping from the sky seconds after taking off from heated birdbaths, and wet mourning dove tails freezing to branches or the ground as the water from a bath freezes. How can you safely provide water during the coldest days? Setting an unbreakable shallow bowl of water on a deck railing or tray feeder, and bringing it in after ice forms, is one strategy. To help your birds discover it during that brief window of time is tricky, but by setting it out at the same time each day, your backyard birds may learn the schedule in fairly short order. Seed-eating birds such as this evening grosbeak need more water than birds with more fluids in their food. Heated birdbaths are another strategy. The low wattage can make them very inefficient if you turn them off every night during frigid weather—it can take hours for them to melt the ice come morning—but running them 24/7 wastes energy, especially in the north where the longest nights correspond with the coldest temperatures. If you do use a heated birdbath, try to get or fashion some sort of nonmetallic grille to cover the bath. The goal is to allow birds to insert their bills for drinking without being able to jump into the water themselves.